Two of the biggest U.S. airlines, American and Delta, have notified Chinese authorities of flight plans when travelling through an air defense zone Beijing has declared over the East China Sea, in line with U.S. government advice. The United States said on Friday it expected U.S. carriers to operate in line with so-called notices to airmen issued by foreign countries, although it added that the decision did “not indicate U.S. government acceptance of China’s requirements. A spokesman for Delta Airlines said on Saturday it had been complying with the Chinese requests for flight plans for the past week. American Airlines said it was also complying, but declined to say for how long it had done so. Airline industry officials said the U.S. government generally expects that U.S. carriers operating internationally to comply with notices issued by foreign countries. In contrast, two major airlines in Japan, America’s close ally, have agreed with the Japanese government that they would fly through the zone without notifying China. China published coordinates for the zone last weekend. The area, about two-thirds the size of the United Kingdom, covers most of the East China Sea and the skies over a group of uninhabited islands at the centre of a bitter row between Beijing and Tokyo. Beijing wants all foreign aircraft passing through the zone – including passenger planes – to identify themselves to Chinese authorities. China’s declaration of the zone represents a historic challenge by the emerging new world power to the United States, which has dominated the region for decades. The United States, Japan and South Korea have defied the Chinese move by flying military aircraft, including giant U.S. B-52 bombers, through the zone without informing Beijing. An official of the U.S. administration said China’s action appeared to be a unilateral attempt to change the status quo in the East China Sea, which could “increase the risk of miscalculation, confrontation and accidents”. “We urge the Chinese to exercise caution and restraint, and we are consulting with Japan and other affected parties throughout the region,” the official said. U.S. Vice President Joe Biden is due to visit China, Japan and South Korea next week, and will try to ease tensions over the issue, senior U.S. officials said. On Friday, China scrambled jets after two U.S. spy planes and 10 Japanese aircraft, including F-15 fighters, entered the zone, China’s state news agency Xinhua said. The jets were scrambled for effective monitoring, it quoted air force spokesman Shen Jinke as saying. 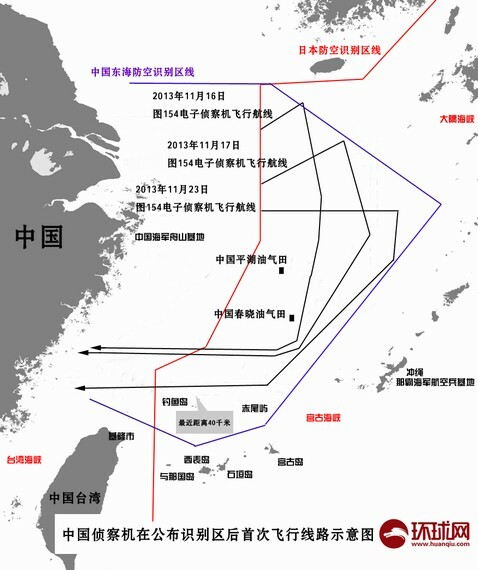 The Chinese patrol mission, conducted on Thursday, was “a defensive measure and in line with international common practices”, Shen said, according to Xinhua. However, Defense Ministry spokesman Yang Yujun said it was “incorrect” to suggest China would shoot down aircraft which entered the zone without first identifying themselves. He did not elaborate. U.S. flights were “routinely” transiting the zone, U.S. officials said on Friday. Flights in the past week included a training mission for two unarmed B-52 bombers. A U.S. defense official said routine operations included reconnaissance and surveillance flights. Japanese carriers ANA Holdings and Japan Airlines have flown through the zone without informing China. Neither airline has experienced problems. The airlines said they were sticking with the policy even after Washington advised U.S. commercial airlines to notify China when they fly through the zone. China’s Foreign Ministry said on Thursday there had been no impact on the safe operation of international civilian flights since the zone had come into force, although China “hoped” airlines would co-operate. 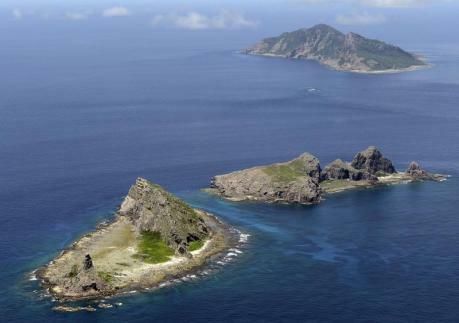 Ties between China and Japan have been strained for months by the dispute over the islands, called the Diaoyu by China and the Senkaku by Japan. Mutual mistrust over military intentions and what China feels is Japan’s lack of contrition over its brutal occupation of parts of China before and during World War Two have added to tension. “It’s important for both sides to take a calm approach and deal with the situation according to international norms,” Japanese Defense Minister Itsunori Onodera told state broadcaster NHK on Saturday. Onodera said the Japanese military had not noted any Chinese aircraft in the zone. Although Washington takes no position on the sovereignty of the islands, it recognizes Tokyo’s administrative control and says the U.S.-Japan security pact applies to them. Europe’s top diplomat, Catherine Ashton, said the European Union was concerned about China’s decision to establish the new air defense zone as well as its announcement of “emergency defense measures” if other parties did not comply. China’s Foreign Ministry spokesman Qin Gang criticized Ashton’s remarks, saying China hoped the European Union could treat the situation “objectively and rationally”. Although there are concerns over the increased tensions, the United States and China have stepped up military communication in recent years to avoid accidental clashes. China’s Global Times, an influential tabloid published by the ruling Communist Party’s official People’s Daily newspaper, praised Beijing for its calm response in the face of “provocations”, saying China would not target the United States in the zone as long as it “does not go too far”. “If the trend continues, there will likely be frictions and confrontations and even a collision in the air … It is therefore an urgent task for China to further train its air force to make full preparation for potential conflicts,” it wrote in an editorial on Friday. But Indian President Pranab Mukherjee’s visit to the state of Arunachal Pradesh in the remote eastern stretch of the Himalayas that China claims as its own provoked a fresh exchange of words. 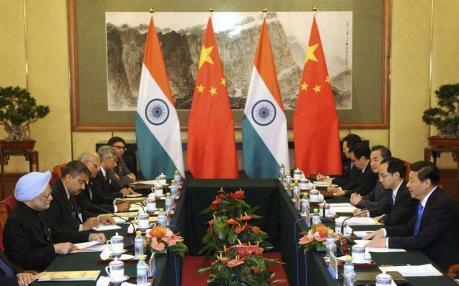 “We hope that India will proceed along with China, protecting our broad relationship, and will not take any measures that could complicate the problem, and together we can protect peace and security in the border regions,” China’s official news agency, Xinhua, quoted Qin Gang, a spokesman of the country’s Ministry of Foreign Affairs, as saying. Mukherjee was on a routine visit to Arunachal which has been part of the Indian state for decades, and where India has regularly been holding elections. But China has of late grown increasingly assertive and questioned New Delhi’s claims over the territory, calling it instead South Tibet. Mukherjee told members of the state’s legislative assembly it was “a core stakeholder in India’s Look East foreign policy” that intends to link the country’s northeast with South East Asia. The Moon could be a “beautiful” source of minerals and energy, a top Chinese scientist has told the BBC. Exotic materials including helium-3 and the potential for solar power could prove invaluable for humankind, he says. Prof Ouyang was speaking ahead of the first Chinese attempt to land an unmanned spacecraft on the lunar surface. The Chang’e 3 lander is due to launch imminently, perhaps as soon as Sunday evening, UK time. No humans have set foot on the lunar surface since America’s Apollo missions ended in 1972. China’s Communist Party has fired a senior provincial official for “suspected serious disciplinary violations”, the official Xinhua news agency reported on Saturday, making him the latest target in acrackdown on corruption. Guo Youming, the vice governor of the central province of Hubei, was removed from his post after China’s corruption watchdog, the Central Commission for Discipline Inspection (CCDI), announced a probe into the official this week. The Xinhua report, which cited the ruling party’s central Organisation Department, gave no further details, but the term discipline violations is generally used to denote corruption. Guo’s dismissal comes a day after China launched a pilot program to make new officials disclose their assets as part of an anti-graft campaign, a step critics say is critical to weed out official corruption. The government this week also announced that two other officials were being probed over graft allegations. Xu Jie, a deputy head of the petitions office, has been sacked for suspected graft issues, while Cai Rongsheng, head of admissions at Beijing’s prestigious Renmin University, is under investigation, in what state media said was related to “corruption cases involving large amounts of money”. President Xi Jinping has made fighting corruption a top theme of his new administration, and has vowed to pursue high-flying “tigers” as well as lowly “flies” to assuage anger over corruption and restore faith in the party. Guo is a long-time official in Hubei, where he served in the water management bureau and as party secretary in Yichang city, near the $59-billion Three Gorges Dam project. His official biography says he was in charge of “follow-up work” on the dam, as well as elements of the controversial North-South Water Transfer Project, which aims to divert river water to the industrialized north. Authorities have already announced the investigation or arrest of a handful of senior officials, among them former officials of oil giant PetroChina, in what appears to be the biggest graft probe into a state-run firm in years. In May, Liu Tienan, the former deputy head of China’s top planning agency, was removed from his post after online accusations of corruption were posted against him, and a criminal investigation began in August. The United States on Friday advised U.S. commercial airlines to notify Chinese authorities of flight plans over the East China Sea although a U.S. administration official said that did not mean Washington accepted China’s new rules. The directive came as tensions escalated over disputed islands in the East China Sea and China scrambled jets on Friday in response to two U.S. spy planes and 10 Japanese aircraft entering its new air defense zone. China last week announced that foreign aircraft passing through the new air defense zone should identify themselves to the Chinese authorities. “The U.S. government generally expects that U.S. carriers operating internationally will operate consistent with NOTAMs (Notices to Airmen) issued by foreign countries,” the State Department said in a statement. On Wednesday, State Department spokeswoman Jen Psaki said U.S. carriers were being advised to take steps to operate safely over the East China Sea, but she did not know whether the new rules would affect commercial airlines, or just military aircraft. “We urge the Chinese to exercise caution and restraint, and we are consulting with Japan and other affected parties, throughout the region,” the U.S. official said. Beijing’s new rules mean aircraft have to report flight plans to China, maintain radio contact and reply promptly to identification inquiries as well as display clear markings of their nationality and registration. China is to launch a pilot program to make new officials disclose their assets as part of an anti-graft campaign, the Communist Party’s anti-corruption watchdog said on Friday. The government has faced increasing public pressure to improve transparency around officials’ wealth, especially after recent corruption scandals involving assets ranging from luxury watches to houses. Under the program, “leading cadres” who are newly appointed or promoted will have to disclose their assets, the occupations of spouses and children, and international travel records, the ruling party’s Central Commission for Discipline Inspection said in an statement on its website. It did not give details on how the assets would be disclosed or the extent to which they would be made public. Proponents of asset disclosure were encouraged by pilot programs in the southern province of Guangdong early this year, but hopes were largely dashed when the system required declaration of assets to the party but did not make the information public. President Xi Jinping has made fighting graft a top theme of his new administration, and has specifically targeted extravagance and waste, seeking to assuage anger over corruption and restore faith in the party. Despite the anti-corruption campaign, China has detained at least 15 activists pushing for officials to disclose their wealth over the past year or so. Experts said the pilot program would be a practical first step. “It’s difficult to cover all the incumbent officials because there are too many of them,” said Zhou Shuzhen, a professor at Renmin University of China who had suggested building such a system to Wang Qishan, the Party’s anti-corruption tsar. 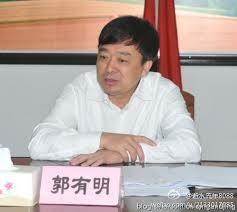 “But bureaucrats always move posts, so after a cycle of three to five years it will cover most of them,” Zhou said. Family and travel information is required because many officials use their positions to benefit family members, amass wealth under their names, or move their family overseas along with illicit funds, he said. China’s new air defense zone, stretching far into East Asia’s international skies, is an historic challenge to the United States, which has dominated the region for decades. For years, Chinese naval officers have told their U.S. counterparts they are uncomfortable with America’s presence in the western Pacific – and Beijing is now confronting strategic assumptions that have governed the region since World War Two. But it took the events of the last week to spark an immediate and symbolic response from the United States – the unannounced appearance in the zone of two unarmed B-52 bombers from the fortified island of Guam, the closest U.S. territory to the Chinese coast. China’s unilateral creation of the zone – accompanied by warnings that it would take “defensive emergency measures” against aircraft that didn’t identify themselves – has raised the stakes in a territorial dispute with Japan over tiny, uninhabited islands in the area. Even as some suggest Beijing’s move is already backfiring, experts in China say it is a part of a long-term effort, carrying broader historic significance for the United States as the traditional provider of Japanese security. The regional tensions will loom large when U.S. Vice President Joe Biden travels to Japan, China and South Korea early next week. Shi Yinhong, a professor of international relations at Renmin University who advises Beijing’s State Council, said Washington had recognized China as a great trade and diplomatic power, and should now acknowledge China needs its own “strategic space”. 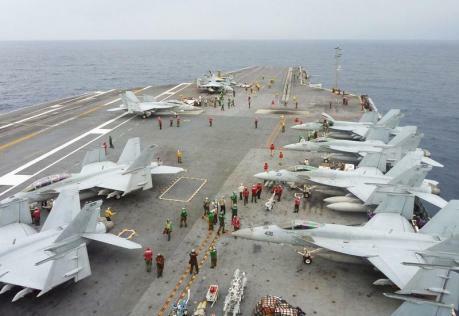 Japan and South Korea, another treaty ally of the U.S., also sent military aircraft through the zone this week without informing China, lending muscle to earlier diplomatic protests. For all the apparent boldness of China’s move, some regional analysts believe Beijing has over-reached, in comparison to earlier campaigns of assertion. For example, China’s rotating presence of ships in seas around Japan’s Senkaku islands, which China claims and calls the Diaoyu, have continued without sparking a direct military response from Washington. Some suggest the fact that Chinese planes have yet to attempt an interception in the air this week, despite the swift flouting of its demands, shows that Beijing’s bluff has been called. They are also puzzled how the move fits with Beijing’s vaunted “soft power” diplomacy – on display recently as China’s leaders toured South East Asia after U.S. President Barack Obama pulled out of a long-planned trip. 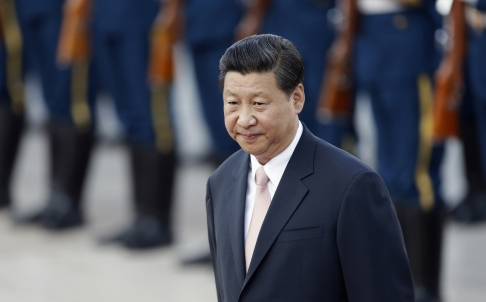 “What (President) Xi Jinping is trying to do is create a balance between soft and hard, conservatives and liberals. This is part of their trial and error process to get the right balance,” said former senior Japanese diplomat Hitoshi Tanaka. The fact China’s zone overlaps Japan’s – including contested islands that the U.S. is obliged to defend under its treaty with Japan – represents a dangerous strategic shift, U.S. officials say. And China’s declaration it could take action against unidentified aircraft that ignored its warnings has sparked fears of an increased risk of accidents and miscalculations. “It causes friction and uncertainty, it constitutes a unilateral challenge to the status quo in … a region that is already fraught,” one U.S. administration official said. In Tokyo, too, there is a sense that China is playing a long-term game – even if Beijing struggles to enforce a move some analysts described as poorly thought out. Speaking privately, one government source said that while it could damage Japan’s “effective control” of disputed islands in the short-term, in the longer term it represented a push by Beijing to create a broad defensive zone across the East and South China Seas. “They don’t feel safe without vast space between themselves and their enemies,” the person said. In China, there is a palpable sense of historic mission. “It’s also about national interests. You have to look in the context of history – there have been many agrarian countries that have developed their economies and then transformed into naval powers. It’s a consequence of a country doing business globally. It’s normal,” he noted.